Hello friends and welcome to the New Year’s Celebration Event brought to you by "The Inspiration Crew". We’re a group of crafty friends who love being creative. This time we're doing a 1 day event to provide you with tons of inspiration to ring in the New Year! We're making projects using products we like and some of us are even offering prizes. Check each blog for which prizes are being offered and when the winners will be announced on that blog. Be sure to click the links at the bottom of this post to visit each of the blogs. Since I snoozed on offering a prize during the holiday hop, I'd like to offer one now. You'll have until 12/31 at midnight PT to comment here and I'll randomly post a winner on the 1st. You can say whatever you want but I'd love to hear about any holiday traditions you have with your family as we are eager to start ours with Amelia. Oh, the prize… the Moustaches set by My Cute Stamps! Here is a photo of one tradition we've started with Amelia - sitting on Santa's lap! Thank you so much for visiting and I'd love to wish you all a very Merry Christmas and a Happy New Year! 12 Days of Christmas - Day 12! Hello friends and welcome to the 12th and final day of our blog event! I hope you've enjoyed the past 12 days as much as I have and I can't wait for the next installment of The Inspiration Crew! What a talented bunch of crafters and I'm so happy to be a part of it! :) A big thank you to Donna and Rachel for getting this off the ground! 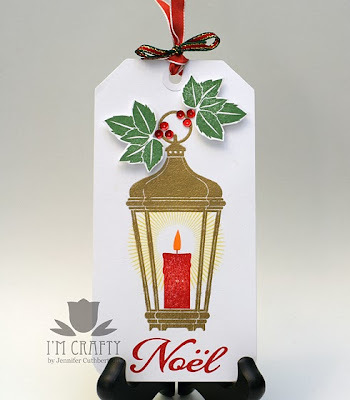 I made a tag for my final project using a fun new set - Alpine Christmas - from Waltzingmouse Stamps. I just love the majestic peaks towering over the sleepy little village! Too cute! I added some mica flakes to the mountain and to the roofs for a little sparkly "snow" and added a couple of fabric snowflakes to seal the deal. 12 Days of Christmas - Day 11! We are going to visit my folks for Christmas and will be spending a lot of time sharing Amelia with family. While we are taking an easy route for gifts this year due to the new baby (gift cards and Harry & David! ), I figure I can gussy things up a bit with some handmade packaging! I started off with a medium sized kraft gift bag and ran a length of burlap ribbon down the center. I took a journaling card and stamped it with one of the sentiments from Seasonal Remedies. 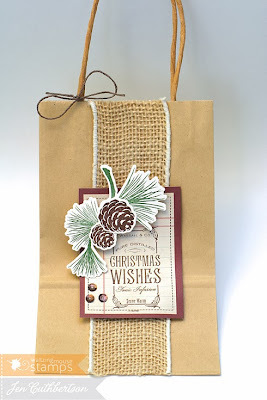 I then used the fabby new dies for the sprig and pinecones from Festive Foliage and added them to the bag. I finished with a few sequins and a twine bow. Simple, rustic, and perfect for a guy or girl gift! Have a wonderful day and thank you so much for visiting! Here are the rest of the ladies who are participating in this fun blog event - I hope you have a chance to visit them! 12 Days of Christmas - Day 10! Hello friends and welcome to day 10 of our blog event! Today I have a pair of quick and easy tags that will be perfect to dress up some Christmas packaging! 12 Days of Christmas - Day 9! Hello friends! Today is day 9 of our wonderful blog event and I'm so glad you've been enjoying what you've seen out there! I have to admit to wanting an ideal Christmas season since it is Amelia's first but it is hard to get everything done with an infant! We just decorated the tree and got the lights up on the house and it's definitely feeling more festive around here! I have a cookie baking day planned this week with a fellow "new mom" who is still on maternity leave like I am and that should be a lot of fun! This is another quick and easy card made from elements of a paper collection (Bundled Up from Crate Paper.) I added some patterned paper to a white card base then stamped a journaling card with a Christmas sentiment and added some coordinating die cuts from the collection for a glittery touch. 12 Days of Christmas - Day 8! For this project, I started off with a large, white shipping tag (I wish I remembered where these came from so I could get more! If anyone knows, please let me know!!) 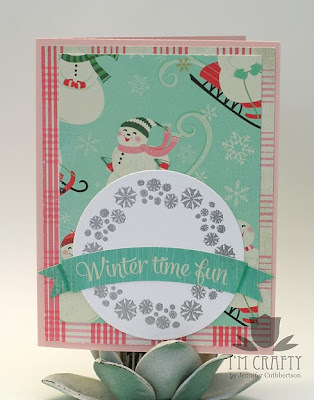 that I stamped with some silver snowflakes and a fun sentiment. I made a snowbank out of glitter at the bottom and pieced a pink tree. I finished the tag with some pink pearls and a white ribbon tie. 12 Days of Christmas - Day 7! 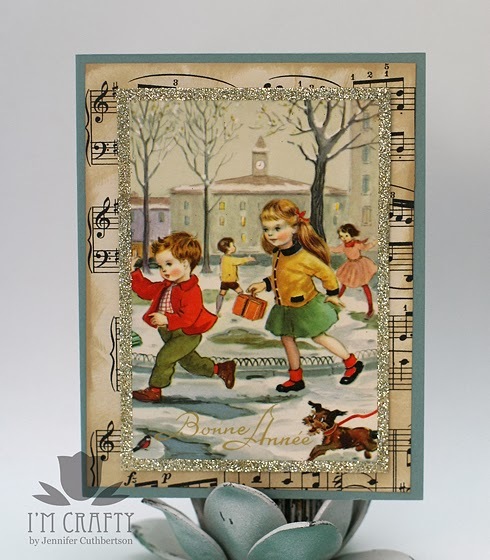 For this card, I again turned to a kit that included the papers and all of the embellishments you see! I layered two papers over a burgundy card base and covered the seam with some trim. I layered two chipboard elements and stamped the scroll with the "joy" sentiment and adhered it to the card with foam tape. I finished the card with a metal snowflake and some gray pearls. 12 Days of Christmas - Day 6! Hello friends and welcome to day 6 of our blog event! Thank you all for your commiseration about infant sleep schedules - just when you think you have it down, it changes, right?!? :) Well, Amelia took a 2 hour nap this afternoon and I got a couple of projects done, including these quick and easy pillow boxes! We give a lot of gift cards and will do the same this year since shopping will be more difficult with little A along for the ride. I took a couple of pre-made kraft pillow boxes and stamped sentiments on them. I then stamped ornaments in coordinating colors, cut them out, and tied them to the boxes with baker's twine. Easy peasy and a nice package for an easy gift. 12 Days of Christmas - Day 5! Hello friends and welcome to day 5 of our holiday blog event! I've loved the projects I've seen on the blogs so far and can't wait for more inspiration! Amelia's sleep schedule has been wonky this week so I've been looking for quick and easy projects to make and this card was the perfect solution! I love buying collections of papers and other embellishments so I know that everything coordinates perfectly when I'm in a time pinch or if my crafty mojo has gone on a little hiatus. :) I layered a couple of patterned papers over a pink card base and then embossed a round snowflake stamped image with silver powder and finished the card with a coordinating banner sticker. 12 Days of Christmas - Day 4! For this project, I started off by embossing a large lantern onto a white shipping tag and then stamping the candle and sentiment onto the tag. I stamped the leaves onto a separate sheet of card stock and then cut them out and adhered them to the tag using foam tape. I finished the tag with some sequins and some pretty ribbon. Thanks so much for visiting today and I hope you have a chance to check out the other crafty inspiration today! 12 Days of Christmas - Day 3! Hello friends and welcome to day 3 of our 12 Days blog event! I hope you've enjoyed seeing the holiday projects - I know I have! Today I have a project to share with you that I made using the new dies offered by Waltzingmouse Stamps! 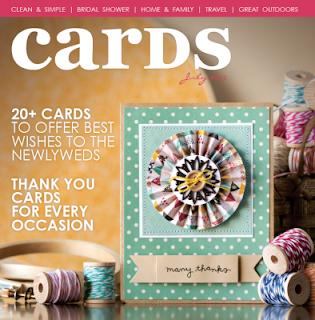 I have to admit to being a bit of a fussy cut snob over the years, actually preferring scissor work to die cuts… until now! The DT each got one set of new dies for the newest release and then everyone swapped cuts and I've been having a ball using mine! 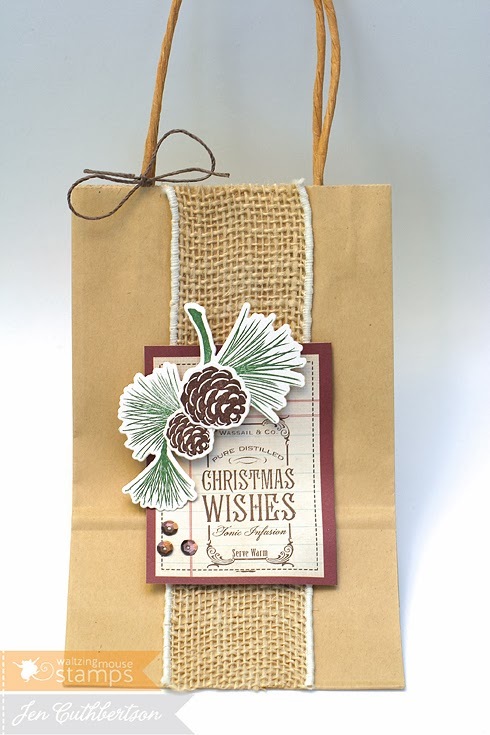 I used the foliage and pine cone dies for this card and am absolutely in love with them! 12 Days of Christmas - Day 2! 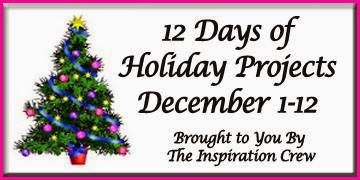 Hello friends and welcome to day 2 of the 12 Days of Holiday Inspiration Blog Event brought to you by "The Inspiration Crew". At the bottom of this post is a list of all the crafty ladies participating in this event. 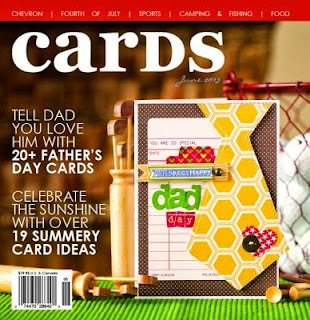 Be sure to visit all the blogs each day for loads of fun Holiday craft ideas. 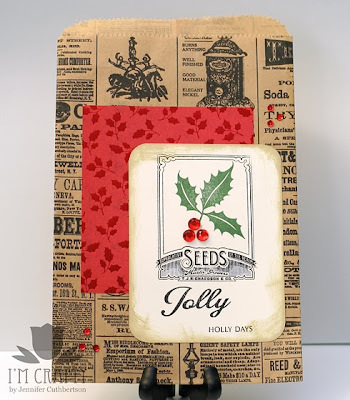 For this project, I started off with a vintage print treat bag and stamped a cream panel with a seed packet stamp, holly leaves, and sentiment from Waltzingmouse Stamps and then added some rhinestone holly "berries." I layered the panel over a panel of patterned paper and finished the bag with some red sequins. Thanks so much for visiting today and have a wonderful day! I live in San Rafael with my wonderful hubby, our cat, Yoda, and our brand new daughter, Amelia. Crafting has enriched my life in so many ways and I've "met" so many wonderful people out here in the crafting world. It truly has become my home away from home. All content (including text, photographs, and design work) is Copyright © 2009-2014 Jennifer Cuthbertson. My art is for personal inspiration only and may not be copied for publication, challenge, or contest submission. While I do accept free product for promotional purposes, I maintain my right to endorse only those products that I personally use and enjoy and will never promote a product I don't personally believe in.